Fans Toys‘ next release is eminent and will be swooping into your collections soon! TFW2005 has an early look at the final packaged version of FT-05, Iron Dibots #2, Soar. We’ve done up over 90 high resolution shots of him in action today, all attached to this story after the break! Mech Ideas have just released their Techno Toon Titans Bluster and Trench, aka Animated style Huffer and Pipes. The duo are based on designs created by Derrick J Wyatt for the Transformers Animated show, but never saw official toys from Hasbro. Mech Ideas picked up that baton and ran with making their own take on the Animated style, starting with the duo of Huffer and Pipes – a pair of figures that are not without their flaws, but do manage to capture a lot of the same spirit and style of the Transformers Animated designs. We’ve got some in-hand shots of this two pack, which started out as some quick pics to share with you guys and quickly grew into a full gallery of both figures – check them out below! TFcon Toronto 2014 is only a little over a week away and the fine crew over there have sent us a sample of their con exclusive – Masterpiece Shafter! Shafter is a repaint of X-Transbots Krank. 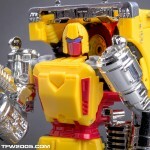 The very erect or stiff color scheme matches the 2012 TFcon exclusive of the same name. You can check out ticket and ordering details, including how to get your own Shafter in hand to play with, over at the TFcon website. For our next gallery update, we would like to draw your attention to our gallery of the TFcon exclusive Gobit, Van Guardian! Van Guardian is a redeco of the iGear Miniwarrior Hench, and like Roswell, is based on one of the original Gobots. Van Guardian is based on Van Guard, a minor character from the Gobots cartoon and one of the 1985 toyline releases. While the grey deco is faithful to the original Gobot, it’s not the most striking deco ever, fortunately Van Guardian is a fun enough little toy to make up for this, with a good range of poseability, a mean shotgun, and a cool feature on the head which can flip round for an optional battlemask. Check out the gallery by opening the link below for a look at this fun addition to the TFcon exclusives collection. For our latest new site gallery, we bring you a look at one of the two Gobits from TFcon 2013! Roswell is a blue and cream colored redeco of iGear’s UFO Miniwarrior, inspired by the Gobot character Pathfinder (who also had an E-Hobby Minibot named for her, which is where this one gets her inspiration). Roswell is a bulky, chunky little robot, evoking the feel of a spacesuit, and the mold has a few cool touches including the dome over the robot head, the 50’s sci-fi style ray-gun, and a display base, to display Roswell in flight in either mode. She is overall a very cute, fun little robot and a nice character to add to the growing collection of TFcon exclusives. Open the link below to check out our gallery of Roswell! Following up on our galleries of the Mech ideas Apex and Geminus unofficial Topspin and Twin Twist, we proudly bring you galleries of their convention exclusive recolors! This pair were shared exclusives between UK Transformers convention Auto Assembly 2013 and Canada’s TFcon 2013 – complete with different names and bios for both conventions. Robot Manuel X / Prototype X and Robot Basil Z / Project Z were based on the Argentinian recolors of the orginal Topspin and Twin Twist toys released in the 1990s – these convention exclusive third party recolors bring the duo to life with sharp new colors and chromed parts including chromed weapons! For our next gallery update, we would like to draw your attention to some extensive galleries of the Mech ideas Demoltion Crue – Apex and Geminus, unofficial and unlicensed versions of Generation 1 Topspin and Twin Twist. Mech ideas are a relative newcomer on the third party scene, but their first full figure releases set the bar plenty high. Apex and Geminus share a basic body type, varying up the molding on the legs, shoulders, head and backpack to produce their unique robot and alternate modes. The designs are true to the original Jumpstarters, even if the alternate modes feel a little boxy. They are fantastic toys through and through though, with astonishing levels of poseability, excellent detail, and a good selection of accessories. There’s lots of nice little touches in the designs, such as the double-jointed elbows, which make these toys for me. Best of all, unlike a lot of third party releases, they are not overly expensive – you feel like you are getting value for money with the Demolition Crue. Keith’s Fantasy Club teamed up with Auto Assembly to bring fans the Auto Assembly 2013 custom figure kit – Bad Cop! Based on the concepts for Transformers Universe Barricade, this kit includes everything you need to customize a First Edition Transformers Prime Vehicon into a Transformers Prime Barricade. The kit is nice and easy to do – all you need is a little superglue to fix on the lightbar, and a careful hand to apply the stickers. Since the head is on a balljoint you can just pop the Vehicon’s head off and plug in the Barricade head, though I found I needed to just gently shave a little plastic off the socket for the ball joint for the best fit. The final effect is excellent – the new head perfectly captures the look and feel of a Transformers Prime character, and the half a dozen main stickers – two for the doors, two for the rear wheel arches and a two-part one for the roof – help to complete the look. In vehicle mode, Bad Cop looks very cool and dynamic, with the additional details added by the stickers complementing the existing look of the Vehicon’s vehicle mode nicely. In robot mode, some of the new details are hidden but the stickers on the vehicle’s sides are now on the arms, which together with the new head gives the robot mode its own identity. Bad Cop was produced in very limited quantities for Auto Assembly. If you were able to get your hands on one of these kits, congratulations, you own one of the cooler third party “garage kit” sets on the market. If you are a fan of Transformers Prime and get a chance to pick up this kit, I recommend you go for it – it is a great complement to any Transformers Prime collection.